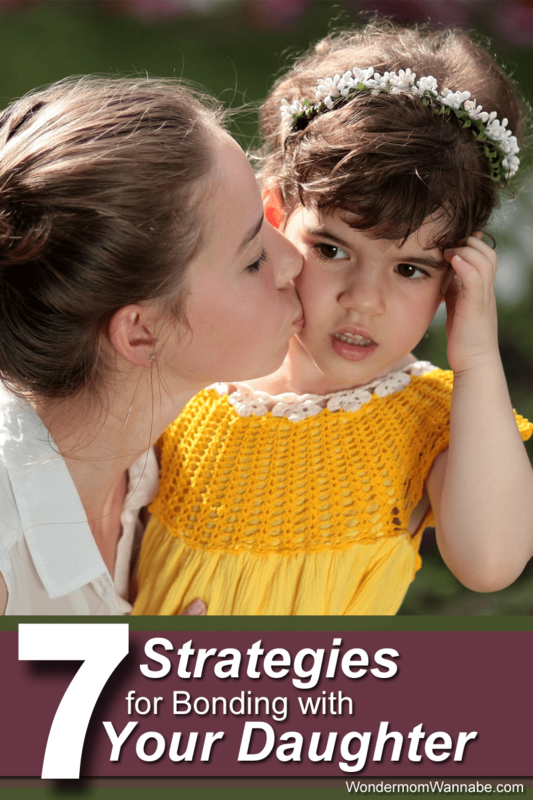 These strategies for bonding with your daughter will help strengthen your relationship. They are all simple ways to get to know each other better. I don’t know about you, but I was a horrible teenager. I’m going to blame hormones, but that excuse probably didn’t help my parents deal with my miserable personality any better. Since I’m a firm believer in what comes around goes around, I’ve been living in fear of my daughter’s teenage years. I’m also a control freak though so I’ve deluded myself into believing I can somehow counteract the dreaded personality shift that I am certain is coming. She only turned 13 last month, so I’m not declaring success yet. However, I think I’ve laid a good foundation for our mother/daughter relationship that might help us get through the next several years being able to stand one another. Even if these parenting tips don’t help us get along if my daughter’s personality gets hijacked by hormones, they certainly made the past several years more enjoyable. The purpose of the mother/daughter journal is to improve communication with your daughter. My daughter is very much like me in that she gets uncomfortable talking about her feelings. We both prefer to write our thoughts and emotions down because it helps us communicate them more coherently. The way my daughter and I do it is she writes in it at night before she goes to bed and gives it to me when I come in to tell her goodnight. Then, while the house is quiet, I read what she’s written and then write my response and my thoughts. After I’ve finished, I leave it outside her door for her to read the next morning when she gets up. I actually stumbled upon this one on Amazon and so I ordered it for us. I like that it includes a variety of different activities and topics to help us focus on what to write. You could easily accomplish the same thing with an ordinary notebook and either create the questions and topics together or surprise each other with your ideas as you pass it back and forth. If you google “bond with daughter” you will find a lot of recommendations for spa dates with your daughter. Most girls do enjoy getting a manicure and/or pedicure with their moms so this is certainly a good choice. Don’t limit yourself to the typical mother/daughter dates though. 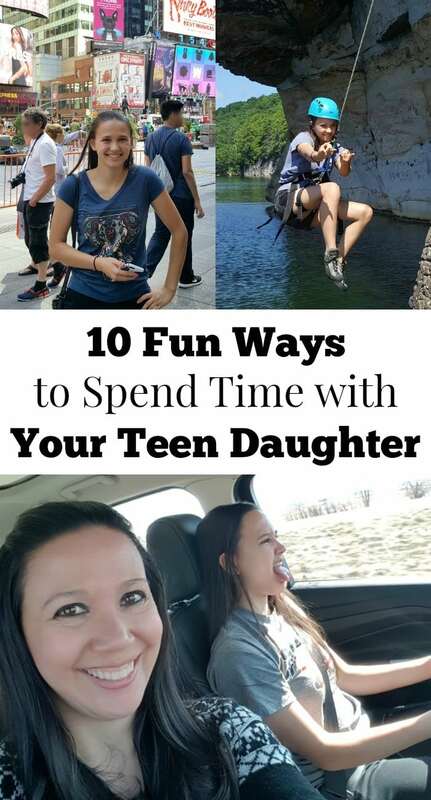 There are many other things you can do with your daughter besides going shopping and getting your nails done. My daughter enjoys the rare, but delicious trip to the Melting Pot for a fondue dinner with me. She also enjoys physical activities like hiking, tennis, biking, and jumping on the trampoline together. We had a lot of fun at a paint-your-own pottery shop once too. So be creative when you plan your outing. One of our favorite mother/daughter activities is doing spa treatments at home. We put on facial masks, deep condition our hair, and exfoliate and moisturize our hands and feet. We look ridiculous while we’re doing it, which somehow makes it more fun. And if you don’t feel closer to your daughter after she’s let you see her in a hair wrap with a clay mask on her face, there might be something wrong with you. My daughter was convinced for a long time that her older brother was my favorite child. For the record, I honestly do not have a favorite child. She believed I did though because my son and I have a lot in common. We both like doing puzzles, we have a similar sense of humor, and we have a lot of the same opinions. In contrast, my daughter is a lot like my mother—an introverted girly girl. I wasn’t sure how to connect with my daughter who had better fashion sense at 5 than I did as an adult, always had a perfect manicure compared to my short, brittle nails, and who could sit in a room with us for an hour and never say a word (and not just because she couldn’t get in a word edgewise with me there). We DID find common interests though and we make the most of them. She shares my passion for office supplies so she accompanies me on all my trips to Staples and helps me organize the office and homework desk. Speaking of organizing, we discovered this was another shared passion. Cleaning out and organizing the pantry or refrigerator is a daunting task when you take it on alone, but together it’s actually fun! Also, much to my husband and sons’ dismay, we developed a mutual love of “Dance Moms.” Judge me if you must, but I love watching that show with my daughter because by the end of each episode my daughter is thankful that I am her mother since she gets to see how much worse it could be. The point is, if we can do it, anyone can. So find something that you and your daughter both genuinely enjoy, not just something that one of you is willing to tolerate for the sake of the other. Then, carve out time to do it together. I know a lot of moms that have spent hours doing fun crafts with their kids. Family Fun magazine always has great ideas and Pinterest is a treasure trove of kid-friendly crafts. I’m not crafty so this wasn’t a big bonding activity for us. We do like putting scrapbooks together. She did one for a school project and we have done a couple as gifts for teachers or coaches and they were really fun to work on together. You could also sew, knit, paint, or sculpt together if that is your passion. The beauty of crafting together is that your hands and eyes are busy so you can communicate more freely. My girlfriend pointed out she has her best bonding moments with her daughter in the car because they are more relaxed talking to one another when they don’t have to make direct eye contact. If this sounds strange to you, picture a disappointing look from your own mother and you will understand why your daughter might rather hold her tongue about her worries or troubles when she has to make direct eye contact. We do spend a lot of time in the kitchen together. When she was younger, she would primarily help me with baking. We still enjoy baking together, now with her younger sister too. As my daughter has gotten older, she’s developed an interest in learning to cook more complex dishes and I enjoy the help. I love our kitchen time together because we usually joke around quite a lot and my daughter opens up more during our cooking sessions. It doesn’t hurt that I feel like I’m teaching her some valuable life skills along the way. I tried to get her to bond with me while folding laundry but apparently when the task isn’t something your daughter enjoys doing, it’s just considered cruel and unusual punishment. If there’s one thing kids love, it’s feeling like they’re insiders in the grown-up club. One of the best, and most fun, ways to accomplish this is to enlist your daughter in a prank. Don’t worry, I’m not encouraging juvenile delinquency. Instead, I’m going to suggest doing pranks that are actually acts of kindness. At various holidays throughout the year, my family likes to leave surprise gifts for our friends. At Halloween we “Boo” people. At Easter, we “Egg” them. You can also leave treats from Cupid, a leprechaun, or an elf at appropriate times during the year. Basically, you put together a basket of goodies (baked goods, candy, pet treats or toys if they have a pet, household knickknacks, and toys for the kids), add a note explaining the purpose of the anonymous gift, and leave it on their doorstep. Although we usually bring all of the kids along for the doorbell ditch, it’s my daughter that usually helps me prepare the basket. We have a lot of fun choosing and preparing the items and discussing what the recipients’ reactions will be. If you’re a regular reader here, you know I think it’s important to instill a commitment to service and a charitable spirit in our children. I’ll be the first to tell you that I’ve been pretty blessed in my life so I feel an obligation to help others when and where I can. I want my children to know that there are more important things in the world than TV shows and video games. I also want them to experience the joy and satisfaction of making a difference. For this reason, I encourage all of my kids to volunteer. Where possible, I like to volunteer with them both to set an example and to enjoy the experience together. My daughter and I have worked school events together, babysat for friends in need, baked cookies for bake sales, and brought pet supplies to animal shelters. You can also visit nursing homes, help at a soup kitchen or thrift shop, weed an elderly neighbors landscaping and plant flowers, or pick up litter in a neighborhood park. 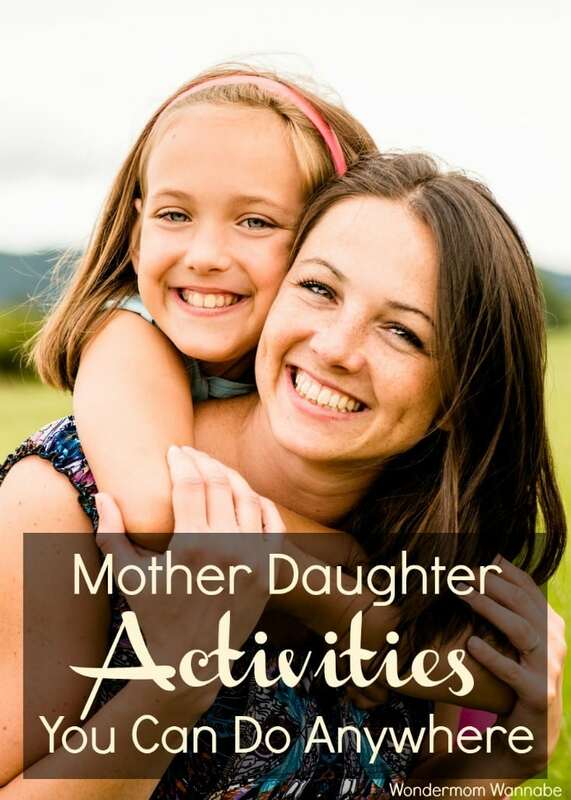 These are great opportunities to set a good example for your daughter while spending quality time with her. Or, print off my monthly acts of kindness calendars and do them together. I hope some of these suggestions help you forge a closer bond with your own daughters. These are just the things we have tried. I am sure there are many others. If you have another suggestion, please share it in the comments. I love the idea of a mother /daughter journal too. My daughter is 16 and there have been a few smart mouthed moments but very few. Now my boy whew the #teen years. very wonderful tips and ideas on dealing with teenagers. i’d have a few more years though before i’d deal with mine, lol! but this is very great post. 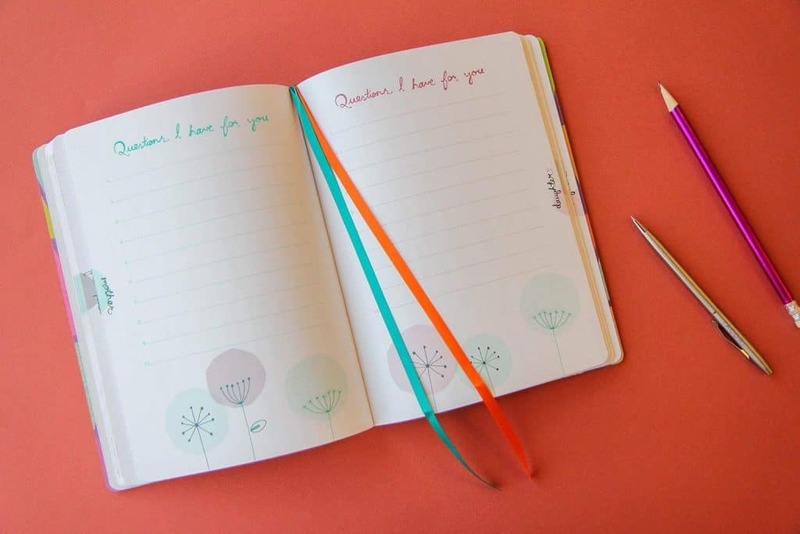 The mother daughter journal is a great idea!! I’m going to try that. Thanks for sharing! Hi Corinne! I love these ideas! I make a point to spend alone time with each of my kids. Each Saturday, one of them goes with me to breakfast and grocery shopping. It’s amazing how even the older two (who are teenagers) can’t wait for their turns. Since we got a dog, one of them goes with me for his evening walk. I think they’re much more candid one on one. Loved the article I to was a hard teenager. Great article for mothers and daughters. Love that you are doing this. I only have boys and do some of these with them. I never had a girl, just my boy. My mom and I bonded long ago probably not the ways most mom’s and daughters do. We dealt with a lot of things going on in our lives together! My daughter and I have a pretty good bond.. she still comes and cuddles with me on the couch and puts her head in my lap.. and she always talks to me about whatever problem she is having.. not to say that she doesn’t have a teen attitude because she does.. she will be 15 in Oct.
Those are great tips. I used to do a lot of special things with my daughter. Now I do special things with my son. I think the most important role as a parent is taking the time to know your child, honor who they are and are becoming and of course loving them. These are really great. My daughter is only two but I love going on little dates with her. She can’t write me but I started writing the occasional letter for her when she’s older. I want her to know how I felt and what I thought in the off chance that I can’t tell her. All these are great ideas…I am sure one can also implement them with their sons (I only have two boys). This list made me think – “How to Keep Your Sanity” lol! You seem like such a great mom and I’m sure your daughter has lots of fun with you! The best ideas I ever learned about. I was quite terrible teenager too and now I think these ones would help me and my mom to find better ways to communicate. Tons of really great ideas. I’m so happy that you have a great relationship with your daughter. I hope to have the same. For my Mother and I, the key was to get past the teenage years. To this day I have never really bonded with my Mom–not that she didn’t try! I do love her–but we are two such different people!! I am glad to hear that you have discovered ways to bond with your daughter!